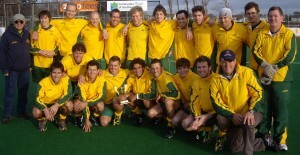 It has been a busy year for the Australian Hockey Team and it is now almost time for the biggest test of 2009 – the Champions Trophy in Melbourne. Since Ric Charlesworth took over as coach at the start of the year the Kookaburras have played 31 tests, with 23 wins, 4 draws and 4 losses. During this time 31 players have pulled on the green and gold shirt, including 14 debutants. Ric is trying to build a deep squad and this means that competition will be very intense for the final 18 that head to Champions. Since my last post at the end of our European Tour, the team won a 3 Nations / 4 Team tournament against Malaysia, Canada and Australia A in Canberra. After that we were off to Invercargill for the all-important Oceania Cup and World Cup Qualifiers against New Zealand and Samoa. The first game was a 26-0 win against a very inexperienced but enthusiastic Samoan team, a game that will remain in my memory for that fact that neither myself nor fellow goalkeeper Nathan Burgers were in the 16 that played! Defenders Kiel Brown and Luke Doerner played a half each in the net for the first time and were certainly talking up the fact that they kept a clean sheet afterwards. Burgers and I resumed our spots in the two games against NZ, and it was a great relief when we won the final 3-1 to take our place in next year’s World Cup. I’ve attached a photo of the team after the game – I’m the one wearing the beanie (it was pretty cold in Invercargill, although none of the other boys seem to be feeling it). More recently we took a relatively inexperienced side to KL for a 5 Test series against Malaysia, who are themselves preparing to head to Invercargill to try and win a World Cup spot ahead of New Zealand. We won the series 3-0 with two draws, and it was great to see three new faces make their mark, namely Jono Charlesworth, Matt Swann and Matt Gohdes (see photo attached). 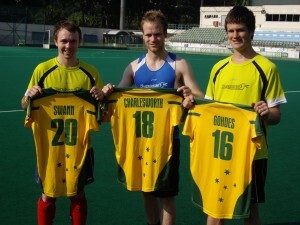 Jono is a team mate in the WA Thundersticks side and Gohdesy plays in my club team, Hale, so it was good to play a test match with both of them. Over the next couple of weeks there are three intra-squad trial games that will be the playing group’s last chance to impress selectors before the team is named for Melbourne on November 10. For the keepers it’s a case of 3 doesn’t go into 2, so Burgers, George Bazeley and I will be doing our best to earn selection in the upcoming games. Hopefully I’ll be back soon with some good selection news in my next post! Obo stuff is always amazing..